One more glamorous event from this week's Belgian state visit to Denmark: the return dinner. 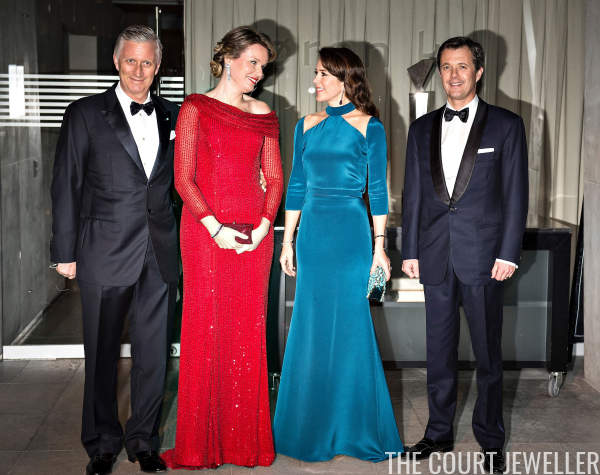 King Philippe and Queen Mathilde threw a black-tie dinner for their Danish counterparts at The Black Diamond in Copenhagen this evening -- here's a look at the jewels they wore. 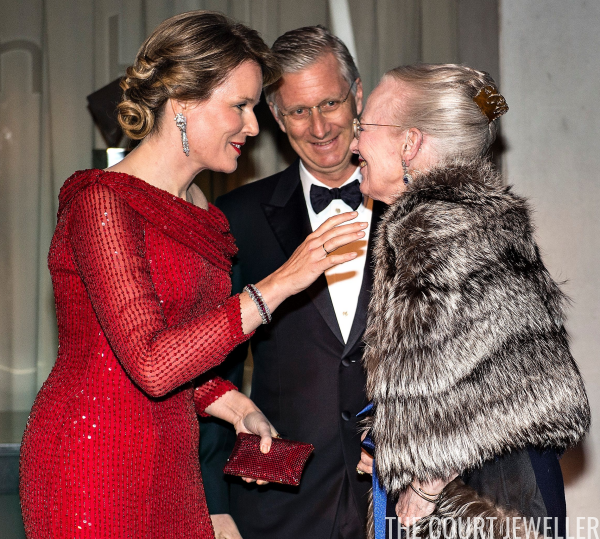 Queen Mathilde wore her lovely diamond fringe earrings for the dinner, along with the ruby and diamond bracelet that belonged to the late Queen Fabiola. It's a bit difficult to see Queen Margrethe's jewels, but I believe she's wearing pieces from the sapphire suite that belonged to Queen Alexandrine. (Because the sapphire demi-parure lacks a tiara, she often wears it for black-tie events.) She also has a metallic comb in her hair, and you can see her golden family bracelet on her left wrist. Crown Princess Mary sparkled in her amethyst briolette drop earrings, plus three sparkling bangles. One is the usual Cartier Love Bracelet that she sports on her left wrist. Here's a better look at Mary and Mathilde's evening ensembles. Mary's gown features illusion netting at the shoulders.